A lavishly illustrated 36 page book of poems and clever tidbits featuring animals and their peculiar habits, features and surroundings. A quick read for children - particularly good at story time - and cleverly written so that adults will truly enjoy the experience. For example: "Snails... Incredible. Some think them Edible!" Smiles are guaranteed. And the unique drawings of each animal are as intriguing as the poems themselves. 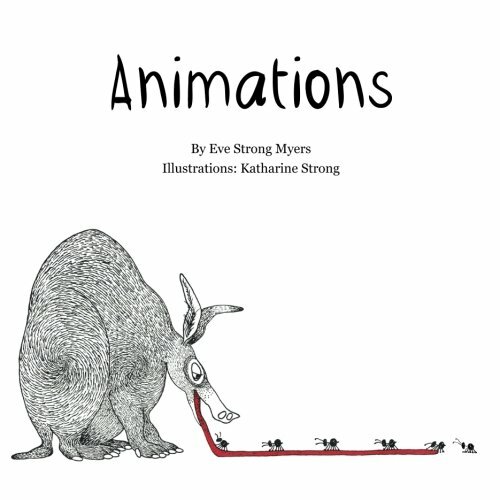 Eve Strong Myers and her sister Katherine Strong have worked together with words and pictures ever since they were children growing up in the marshes of Savannah, Georgia. Animations, their first published book, is a lifelong labor of love that started out as "something fun to do" and has evolved to the point of "something spectacular to have done." Kakie lives in Tybee Beach and is working on sculpture and paintings inspired by whatever comes her way from nature. Eve lives across the river in Wilmington Island and is continually working on word play and puzzles. Eve is the author of over 100 Quote acrostic style puzzles that she sells on her website www.TheAcrosticsPlace.com. There's nothing slowing down these ladies as they follow respective passions of wordplay and color.